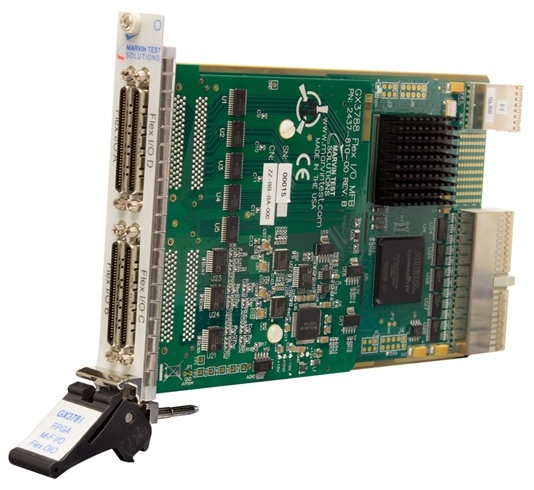 PXI FPGA Multi-Function I/O Card - GX3788 | Marvin Test Solutions, Inc. The GX3788 is a user configurable, FPGA-based, 3U PXI multi-function card which supports digital and analog test capabilities. The card employs the Altera Stratix III FPGA which features over 45,000 logic elements and 1.836 Kb of memory. The GX3788 is based on the GX3700 FPGA card and includes an integral daughter board which provides 8 differential input, 16-bit, 250 KS/s A to D converters and 8 16-bit, 1 MS/s, D to A converters. The module's FPGA is pre-programmed, providing access to all digital and analog functions. Alternatively, users can program or modify the FPGA , allowing the user to adapt the module to their own specific test needs. The design of the FPGA is done by using Altera’s free Quartus II Web Edition tool set. Once the user has compiled the FPGA design, the configuration file can be loaded into the FPGA directly or via an on-board EEPROM. The GX3788’s digital I/O signals are TTL compatible and can be programmed as inputs or outputs. The A to D channels can be configured as 8 differential or 16 single ended inputs and support a sampling rate of up to 250 KS/s. Alternately, two channel operation can support a sampling rate of 1 MS/s. The D to A channels support a simultaneous sampling rate of 1 MS/s. The FPGA device supports up to four phase lock loops for clock synthesis, clock generation and for support of the I/O interface. An on-board 80 MHz oscillator is available for use with the FGPA device or alternatively, the PXI 10 MHz clock can be used as a clock reference by the FPGA. The FPGA has access to all of the PXI bus resources including the PXI 10 MHz clock, the local bus, and the PXI triggers; allowing the user to create a custom instrument which incorporates all PXI bus resources. Control and access to the FPGA is provided via the GX3788's driver which includes DMA and interrupt support tools for downloading the compiled FPGA code as well as register read and write functionality. Additionally, dedicated interface logic supports the PCI bus, eliminating the need to incorporate the PCI bus interface into the user's FPGA design.